This architecture, engineering, and building is off the charts! One of our latest! In the finish process, the Petrarca lodge is a favorite! A Bob Lindsay design, this home is full of custom detail. We will post inside pictures as it comes along. After completing the structural framing phase of our Passive House in Mountain Lake Park, we were thrilled with the results from the first blower door test. Designed by Carri Beer of Brennan and Company Architects, and Michael Hindle from Passive to Positive, this home could be the first certified Passive House in Garrett County. Our crew spent a lot of time working to seal every potential thermal break. Thermal breaks could happen at any utility penetration, plywood seam, and exterior framing connection. As we were all huddled inside, we started the blower door test, and had to go all the way down to the smallest flow ring available on the fan. The rings are necessary when measuring air tight houses. Even Mark Watkins from Hot Shotz was shocked with our results of .2 ACH50. Maryland energy code requires 3 or better, and the Passive House requirement is .6 to pass. The next blower door test will happen after the exterior TJIs and insulation go on. C-ring is shown here. Time to get the D and E rings! We are nearing completion of another custom home on Deep Creek Lake in the Thousand Acres development in Swanton, MD. The Homeowners will be settled in just in time for the Winter holidays and Ski Season! This 5 bedroom, 5.5 bathroom custom home was designed by local Architect Phil Silkey, AIA. The home includes a state of the art home automation system with security and incredible sound systems. It is also equipped with a golf simulator and billiard room. Can you get excited about these tile drains, because we are! As this building comes out of the ground, it is crucial to continue the tight air barrier in this Passive House. The details of the buildings are designed so that every possible break in the air barrier can be managed. Our crew is well equipped with some of the best tapes in the industry, including the Tescon Vana tapes seen in these images. In order to become a certified Passive House, homes must pass a final blower door test in order to comply with .6 air leakage requirement or LESS. For context, Maryland homes only have to have 3 or lower to pass the energy code. CMU Block air barrier is kept long, ready to overlap and be taped to plywood sheathing. We have had the pleasure of working with the staff from the local Mountain Laurel Medical Center for the past few months. Yesterday was their Open House, and while the weather was a bit gloomy, it was an exciting day as we turned over the keys to their new location in Grantsville, MD! The official ribbon cutting ceremony will be in a few months, but they saw their first patients yesterday, and continue to add new patients. This Owner-Client relationship was not typical to our normal build process. Beth Little Terry, CEO of Mountain Laurel Medical Center, and Jeff Gosnell began discussions about a year ago to figure out how to get the project built, which included some timing complications with grant funding opportunities. Everyone agreed that this Medical Center would be a great opportunity for the town of Grantsville and its community, and we needed to make a decision on how to move forward. After some discussion, approval from the board, and funding assistance from First United Bank and Trust, Gosnell decided to construct the building under their ownership, and lease it back to Mountain Laurel, who at a later date will purchase the facility. The design for the Medical Center fits elegantly into its surroundings, and is a welcome addition to the community alongside the Library, ball fields and residential homes. The Architect on the project was Bob Lindsey, AIA, from LAI Architects. Earlier this summer we started construction on a Passive House in Mountain Lake Park. The home was designed for a local couple who have had their heart set on building a sustainable home for years. The owners began working with Carri Beer, AIA, LEED AP, from Brennan and Company Architects, and Passive House consultant Michael Hindle. The Passive House has many energy efficient and sustainable details. Below are some photos of the excavation, foundation, and footing insulation. 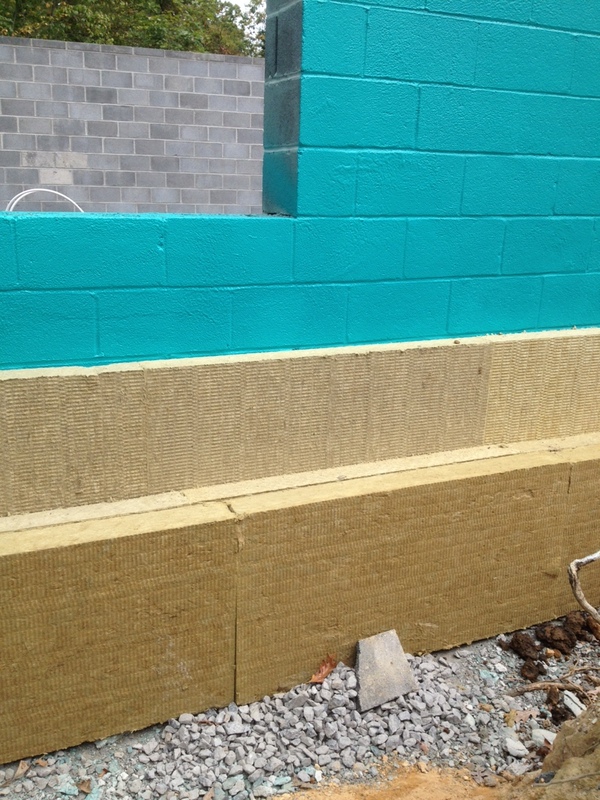 The footings bear on a cellular glass insulation block called FOAMGLAS from Pittsburgh corning, and the under slab, interior and exterior of the footings have Roxul Rockboard mineral wool insulation. Gosnell Builders completed the first phase of the HART for Animals building in Accident, MD in March 2014. Located near Deep Creek Lake Maryland, HART is a Non-Profit organization that works alongside the Garrett County Animal Shelter, providing a first-class animal adoption center for Garrett County and the region. HART's insulation package incorporated spray foam insulation and many air sealant applications in order to provide a nice warm and welcoming atmosphere for staff, visitors, and pets! HART for Animals provides a great service to the Deep Creek Lake community. Many local residents and visitors are grateful for for the Bed 'n Bark Inn, the Bredel Veterinary Clinic, and the Adoption Center. Job Benefits! HART staff holding a litter of puppies. Last Spring we had the opportunity and privilege to keep some bear cubs warm on the Ridgeview Valley property while Maryland DNR replaced a battery in their Mother's collar, which DNR uses to track the State's bear population. Maryland public television came out to film the event, and some asked questions about the mother taking back the cubs after humans had held them. We followed up with DNR a few weeks later and yes, the mother did accept her cubs back into the den, and it is in fact common for them to do so. This custom home, built on Laurel Lane near the Deep Creek Lake State Park, was designed by McInturff Architects. This contemporary design strays from the traditional architecture that occupies the shorelines of Deep Creek Lake, and our builders were up for the challenge. The typical Garrett County winters could be stressful on the flat roofs, so one has to be mindful of snow loads and water drainage, and this elegant design provided structure and drainage, ready for the harshest snow conditions. The abundance of glass lends itself perfectly to the stretch of lakefront that presents to the kitchen, dining, and living room. This home features multiple energy efficient systems including an ICF Foundation (Insulated Concrete Forms), spray foam insulation, and a hybrid heating system from Carrier with Greenspeed intelligence. This system integrates a heat pump recovery system with a gas furnace. For example, when you set your thermostat to 70 degrees, the furnace kicks on, but once it gets to a certain temperature, maybe about 65, the heat pump recovery system takes over, and saves on your propane usage. "As architects ( or homeowners), when we build at a distance , it is important to select a builder who will always do the right thing- communicate well, know when to ask questions, and execute a consistent level of craft that doesn't need watching over. Gosnell is just that kind of builder. From preliminary planning to final punch list, they are a pleasure to work with and consummate professionals. As a result, we don't need to be at the site every day to make it right. They are there, and it will be right." We understand the importance of energy efficiency for our clients, so we work in collaboration with experienced Engineers and Architects to create comfortable, energy saving building systems. This custom home overlooks the slopes at Wisp Resort in Western Maryland, near Deep Creek Lake. This ski-in, ski-out vacation home includes 6 bedrooms, 6.5 half baths, and a Guest Suite above the garage. Featuring rustic barn wood siding and timber trusses above the great room, every material in this home was meticulously chosen with special regard to create a Healthy Home. 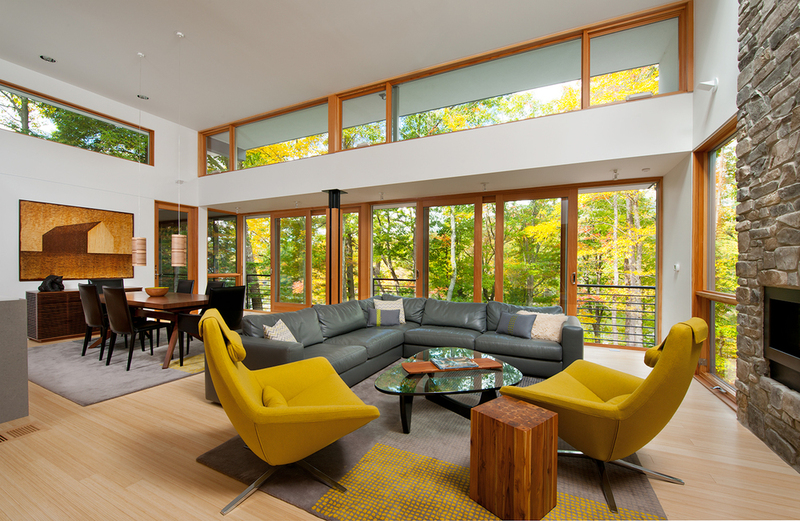 This Healthy Home included a geothermal heating system, AirKrete insulation, multiple air sealant applications, and triple pane windows to create an extremely energy efficient home. Gosnell Builders worked with a Healthy Home Consultant to be sure the design of the home followed specific guidelines. Every material from the fiber glass rebar to the paint and caulk was specified in regards to its low VOCs and off gassing components. We even worked with an electromagnetic field consultant to design special wiring to combat the electromagnetic radiation.